I’m so much bigger now I’m three. 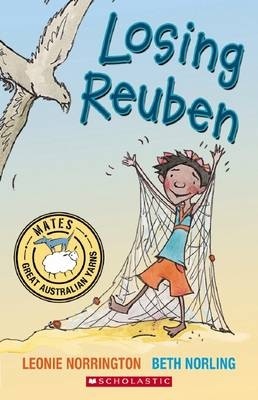 This exuberant picture book is a delightful exploration of childhood, particularly within an Aboriginal community. As the young protagonist cavorts through the pages, he is watched – and helped – by a variety of doting family members. 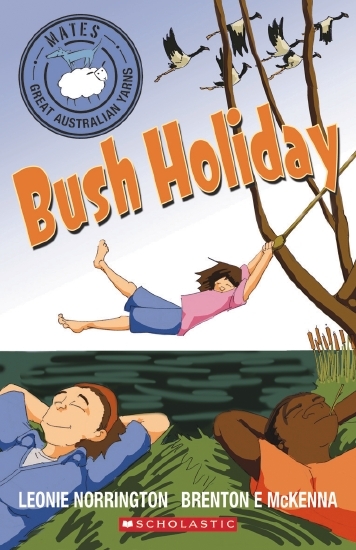 Most of the experiences and actions expressed in the text are ones which children and parents of every background will relate to – running, jumping, copying, giggling, bumping – but the illustrations set the action outdoors in a remote community with trees, ochre landscapes, even crocodiles adding interest for children from other parts of Australia and, importantly a setting to which children from such isolated communities will relate. The creators, author Leonie Norrington and illustrator Dee Huxley, visited three northern communities and workshopped ideas for the text and illustrations, creating a delightful celebration of childhood and community life. Damien is running down he road pulling his mum, holding her tight so their out-of-time steps don’t jerk their hands apart. But she won’t. So he flips her up onto his back and gallops on all fours, his hands and feet stretching out like a horse. There’s a house in the distance. We can hide in there. He’s running as fast as he can. But it’s not coming any closer. The house isn’t coming any closer! The road is moving beneath him like a running machine, keeping him on the same spot. The men are shouting now, firing shots. Trees and dirt explode around him. Damien ducks into the bush, running close to the ground; his lean body curves like a panthers’, the silent bush stroking his smooth black hide. Mum is asleep along his back. He gets to the yard, slips around the side of the house, crawls beneath his old bed, supple as an eel, and into Mum’s bedroom. And they’re there, waiting, all of them, sitting on Mum’s bed: Bedford, 88, Uncle Ronald, Gregory and Mum. Damien and his mum have moved. Again. This time, they’re in the Northern Territory and Damien has started at yet another school. It’s not going well. His mother has a history of partnering with violent men. This time though, she assures him, things will be different. Damien has heard this before, and it’s always the same. Things start well, go downhill until he and Mum have to run. Again. So it’s no wonder really that he struggles to adjust to a new school, to make new friends, to trust anyone. And now his mother looks like she’s taking up again with 88, Damien’s father who has beaten her before. Damien’s only solace is drawing. He draws when nightmares wake him, and when thoughts overwhelm him in daytime. The Devil You Know is both unsettling and compelling. From the front cover, showing a cowering boy and a large tattoo-ed man, it’s clear this is not going to be a fairytale. But Leonie Norrington’s touch is light, even when describing or alluding to the weightiest matters that a teenager should never have to face. The reader is invited into Damien’s world, asked not to judge him, but to walk with him awhile, to understand the life that has shaped him. Damien is a survivor, but he carries scars. Damien does find friends, not always where he first looks for them. Themes include domestic violence, bullying, racism (although some of the strongest and most empathetic characters here are aboriginal) and abuse. Highly recommended for secondary readers. This title can be purchased online from Fishpond. Camping at Barrumbi, Dale has a disturbing dream about his big brother, Sean. When he wakes, he sees Sean creeping away from the campsite, and wonders whether he should tell him about the dream. When the time comes to leave Barrumbi, Sean cannot be found. Back at the community, Dale’s family face a long wait for news of Sean’s fate. In the meantime, the whole community suffers the devastating effects of Sean’s actions. The wet hits with a vengeance, flooding the settlement and the water spirit tries to drown first Dale, then his sister, Meg. Will the family be intact at the end of the wet? The Spirit of Barumbi, a sequel to Barrumbi Kids, picks up the story where the earlier book left off. This book, however, may appeal to a slightly older audience than the first. It is full of adventure, suspense and an explortaion of the difficulties of trying to live in two cultures – those of the traditional Aborigine and the contemporary world. Norrington’s prose is brilliant, drawing the reader into the emotional turmoil, whilst providing relief in lighter moments. Dale and Tomias are best friends. Dale’s grandfather was the first white man to setle here at Long Hole, where Tomias’s ancestors have lived since the dreaming. Their Mums grew up together too. Now they’re in year seven, their last year at the community school. It’s supposed to be fun – but the arrival of Gordon and his father, Mr Armstrong, has changed things. Mr Armstrong manages the community and his new rules upset everyone. Gordon thinks HE owns the place. The Barrumbi Kids is a delightful story about growing up in Australia’s remote communities. Dale and Tomias, and their friends, move between Aboriginal and white cultures – fishing, hunting, playing and going to school. They get into trouble and they learn about themselves, about each other and about the wider world. Leonie Norrington spent much of her childhood on a remote community in Australia’s north, part of a large Irish-Catholic family. She later worked in journalism. This is her first novel for children. Barrumbi Kids is a an exciting novel, suitable both for classroom and private reading.